The five teams racing in the Volvo Ocean Race Leg 5 from Auckland are being pushed to the extreme of human endurance by ferocious weather as they race through the Southern Ocean towards Itajaí in Brazil. CAMPER with Emirates Team New Zealand (Chris Nicholson/AUS) has retained their lead, but conditions are such that it is now not so much about winning, but more about keeping the boats manageable in a huge seaway with howling gales, and holding everything together in order to reach Cape Horn. 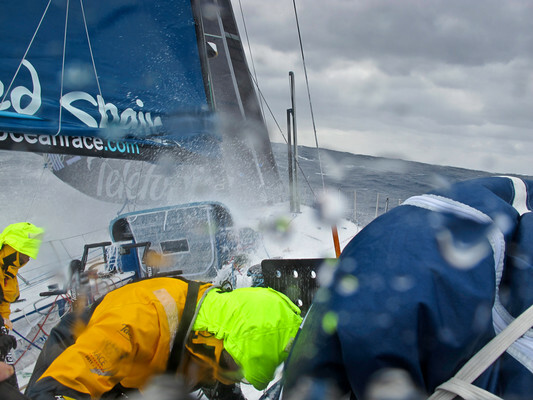 The only way to keep the boats in one piece is to sail slower. In previous Whitbread races, the fleet was forced to sail south amongst the ice in order to pick up the ‘furious fifties’ and the ‘screaming sixties’, the winds needed for the much heavier boats of the past to surf fast downwind. Today’s lighter Volvo Open 70s require much less breeze to out-perform their historic counterparts and are able to achieve higher speeds much further north. But the threat of damage to boats and crews remains the same and could be catastrophic at this point in the leg. There are no ships in the Southern Ocean to come to the rescue and the fleet is almost certainly beyond the range of aircraft. The only help in the event of a crisis would be from the competitors themselves, something the highly experienced crews are very aware of. 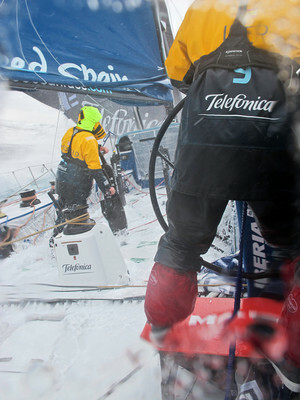 Consequently, all five crews are sailing as sensibly as they can, while still trying to keep a competitive edge. “I think everyone has slowed down; some more than others. 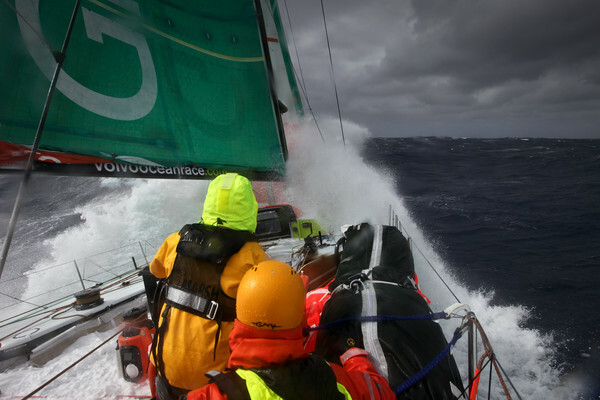 It is for the guy steering to use his seamanship,” said Charles Caudrelier, helmsman/trimmer from second-placed Groupama (Franck Cammas/FRA). 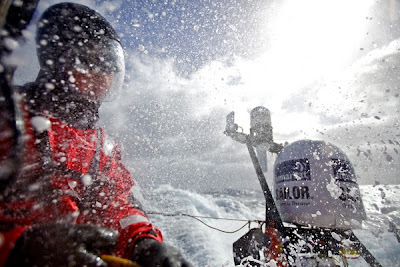 “We are far from being as fast we would be if the sea state were good. 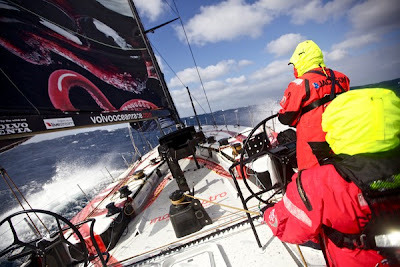 We could be above 30 knots of speed and we are actually around 20 to 25 knots. So we reduced sail area and are nursing the boat,” he said. At 1900 UTC, the pack of four led by CAMPER is a third of the way along the ice limit, but the wind is forecast to exceed 40 knots, with gusts of 50 knots as they approach the central ice limit waypoint 546 nautical miles ahead. CAMPER led Groupama by 10.2, with Team Telefónica (Iker Martínez/ESP) and PUMA Ocean Racing powered by BERG (Ken Read/USA) in fourth. Just 40 nm separated first from fourth. 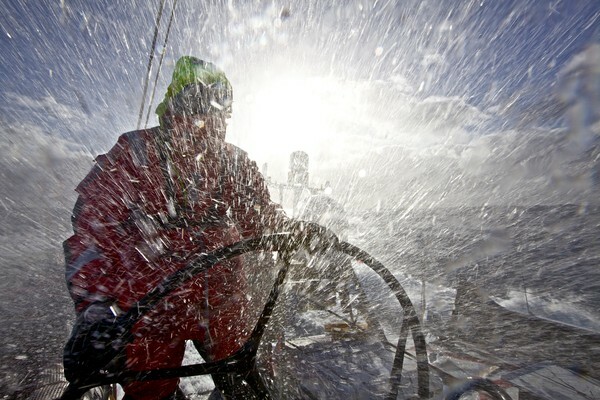 Abu Dhabi Ocean Racing (Ian Walker/GBR) in fifth have a tough choice to make. 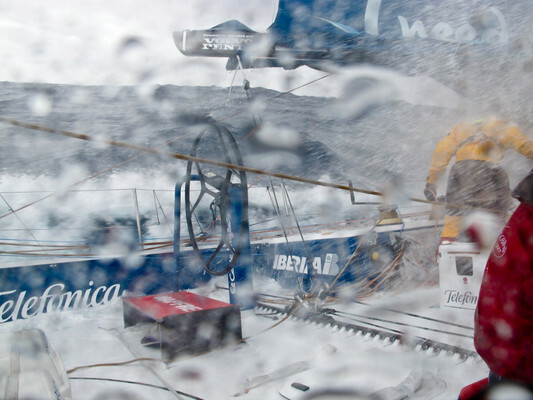 Nearly 500 nm adrift of the leaders, who are sailing away at over 20 knots straight down the course, a bubble of high pressure has grown directly in the path of Walker and his men. Meanwhile, Team Sanya and Mike Sanderson continue their lonely sojourn towards New Zealand, where they will face some tough decisions on how to get back in the race as quickly as possible.